Join Teen Advisory Group for 2014/2015 School Year! I can’t believe that fall is almost here! Another school year will soon be here and that means that at Budimir we’ll be starting up our 2014/2015 Teen Advisory Group. You might be wondering what Teen Advisory Group (TAG) is all about and here’s the lowdown. TAG members must be in high school and will receive volunteer hours for participating in group activities. We meet monthly on the 2nd Wednesday on the month. 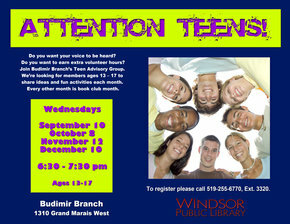 If you’re interested in joining or have additional questions about Teen Advisory Group, please contact Leisa at lpieczonka@windsorpubliclibrary.com. Hi, Miss Leisa. My name’s Taneikah and I’m a sixteen year old in Grade 11 at F.J. Brennan High School. I am very much interested in joining the Teen Advisory Group. I love to read books and would like to participate in your different events. I’m looking forward to hearing from you. Thank-you. We’re so pleased that you’re interested joining our Teen Advisory Group. Please send me an e-mail at lpieczonka@windsorpubliclibrary.com and I can give you all the info you need to get started before our next meeting on October 8.